I don’t know what 2011 holds, but I will write about it. I did not write as much this past year, and hope to increase my rate of posting some this year. Recently someone asked what criteria I use to decide what to write about. I pretty much just write whatever I want whenever I want. If it strikes a chord, I write about it. That’s why this is the “Scott Link Blog” and not the Media Ministry blog or iOS blog. I write about stuff I experience, and will continue to do that this coming year. Email is evil. OK, not really, it’s just a tool, but there are times when I think that email is truly evil. I have been on vacation for a few days, and I turned off my email. So I know that I must go back to work in a day or so and read through all of that communication. Not because I don’t want to catch up, but because I don’t want to run into an email that is rude, or cross, or hurtful. People say things, either without thinking or with purpose, in an email that they would never voice in person. I have often cautioned the people I work with about what they write in an email. One, don’t compose an email when you are angry. Pick up the phone or walk to the person’s office. Call a meeting if you have to, but do not send an email when you are upset. You may be upset by an email the other person has just sent you, but do not reply in kind. Even if the other person has copied the entire world, don’t shoot off a nasty-gram in reply. Call them or go see them. Then if you need to correct something, reply to the email later with a “I just talked with so-and-so and this is what we decided…” kind of email. If you must send an email in reply to an angry one, take a break. Cool down and think clearly before you reply. Two, take into consideration who you are writing to and how they will receive your words. There is no tone of voice or body language with email. -Assume they will take it the worst way. You may think that they will understand your joke, or will know where you are coming from. But don’t. I have seen innocent comments turn into great offenses. Be clear, not clever. -Can this subject be communicated clearly through a short email? If you must write three pages to explain yourself use the email to schedule a meeting or a call. -Is the recipient personally invested in the subject? I was once asked to evaluate another church’s media and video work. I knew that the people who did the actual shooting and directing would see the email, so I tempered my words. I told the truth, but it was kind. Knowing your audience and bearing that in mind while writing will help make sure that your email is effective without being offensive. Email is a requirement in modern organizations, but how it is received can be helped with a little time and attention. Yesterday we were supposed to host the Christmas in the Park @ Lake Eola Christmas Concert. I say supposed to because it rained pretty much all day, and the weather was generally not suitable for an outdoor event. I won’t go into the hours and hours of prep I personally spent on this event. I ran point on this, and was personally invested in this concert more than any other event we had all year. I will admit that I grieved a bit on the way in to work. It was already raining and the forecast was not good. I knew that the chances of the rain stopping was pretty small. I was not ready to call the concert off. We were still loading the truck. We were moving forward like the gig was on, but the radar was not looking good. About 11:00 AM the various weather resources were al saying the same thing: the rain would stop about 2:00, and then come back with possible storms at 5:00. That was right in the middle of the event. There was an 80% chance of rain during the event. We had to call it off before we moved 200 people to the venue just to have them all get wet and not play/sing for an audience that wouldn’t show anyway. We are lucky enough to have very nice audio gear, and letting it get wet wasn’t really something we should do. We posted all over the web, twitter, and Facebook. We even called the radio station that helped us advertise, and they were kind enough to announce that the event was cancelled. I called or emailed every person I knew that was involved. And that was it. We unloaded the trucks, grabbed a bite to eat and I went home. I checked the radar about 5:30. To the right is a screen grab from a weather app. The green color is rain. Lake Eola is right in the middle. I don’t know how hard it was raining, but it was raining at the lake when we would have been there. 1. It can rain on any day, even in the dry season of Florida. Multiple day events could reduce the chances of getting completely shut out by weather. Drizzling rain and humid air play havoc with strings and woodwinds. We could look at a chamber orchestra, that wouldn’t be as badly affected by weather. 2. There is a “market” for this kind of event. From the limited response we could measure, we had a lot of people who had no connection to our church interested in coming to the event. Several hundred that we can identify, plus more we will never know. People like Christmas music, so coming to a free concert in a cool location sounds like a good idea. The challenge is to figure out other kinds of events that will have the same hook. I’m sure we will think about doing something similar next year. But I don’t want to wait until December. 3. People will take part in this kind of ministry. We had 135 choir members, 35 orchestra players, and a couple dozen other volunteers signed up. Even though most of them had just finished a log run of Singing trees presentations, they were wiling to give up the last weekend before Christmas to do something in the community. 4. I still don’t know how and why God does what He does all the time. I knew this before, and was reminded of it again. I believe that the vision for this kind of event was from God, and continues to be something we should move toward. I do not know why the God who made the weather didn’t just blow the clouds away. As my dad says, I won’t know “this side of heaven” so I will continue to move ahead with the direction God gives. 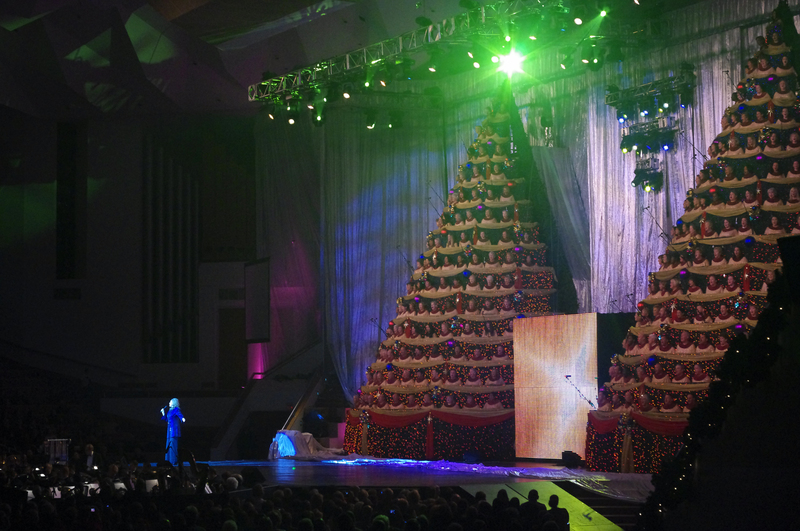 This afternoon is the last presentation for the 2010 Singing Christmas Trees. We saw over 28,500 people in seven presentations over two weekends. This year’s show included scenes from some of the favorite stories of Christmas of years past, and of course, the greatest story of all.. the birth of Jesus. 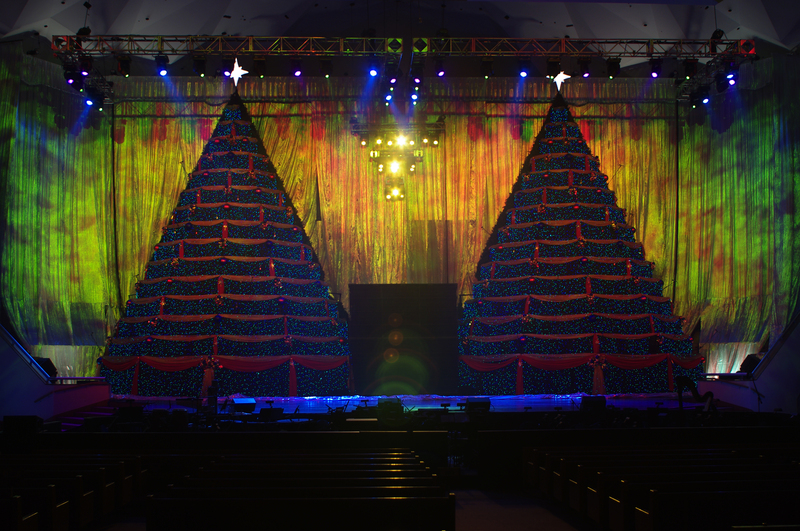 280+ choir members, 50+ orchestra players, 80+ cast members, and tons of behind the scenes people make it happen. A little iChristmas Music from NorthPoint’s iBand.